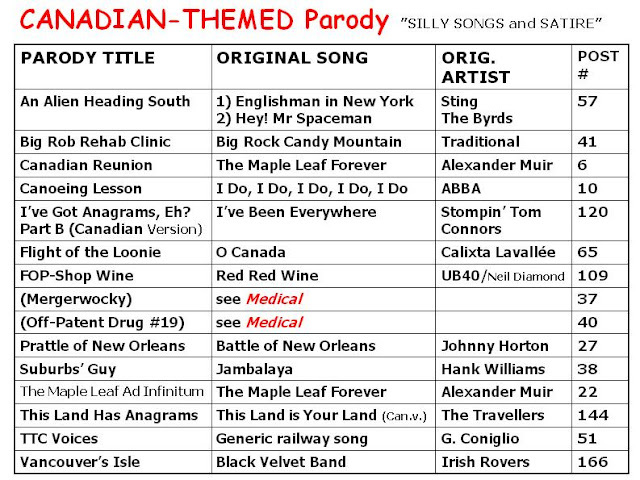 SILLY SONGS and SATIRE: INCONTINENT WORDPLAY(Part B): CANADIAN ANAGRAMS, Eh? 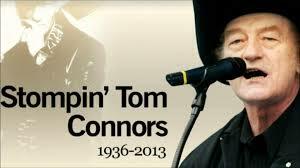 ORIGINAL SONG: "I've Been Everywhere", by Lucky Starr, covered by Hank Snow, Johnny Cash, Stompin' Tom Connors etc. Please also note take-offs of this song posted here as earlier blog-posts. PARODY COMPOSED: Giorgio Coniglio, February 2016. 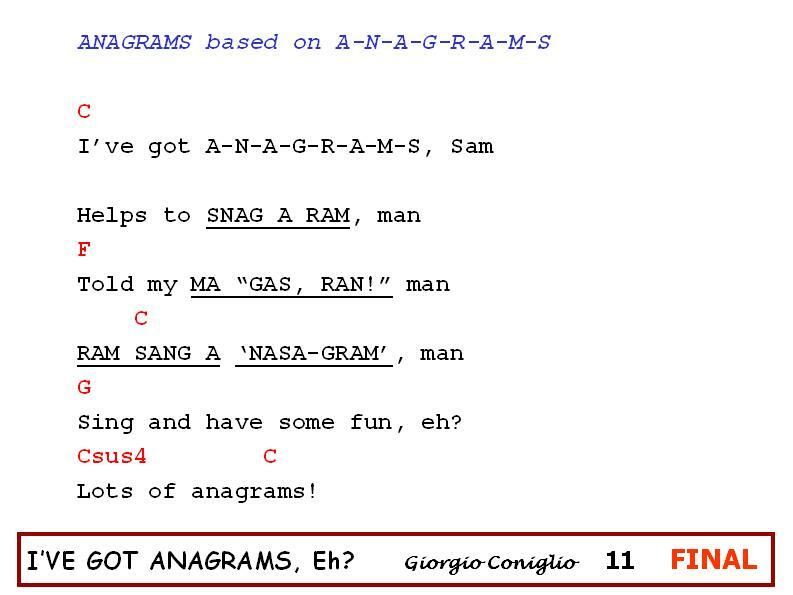 WORDPLAY LINK: An explanation of the derivation of the anagrammatic place-names, and extensive lists are found at "Giorgio's Weekly Wordplay" post #32. The verses of this song consist of anagrams of the word P-A-L-I-N-D-R-O-M-E-S, place-names with 2-letter postal abbreviations, e.g. April Dome NS and Pliers Dam ON. 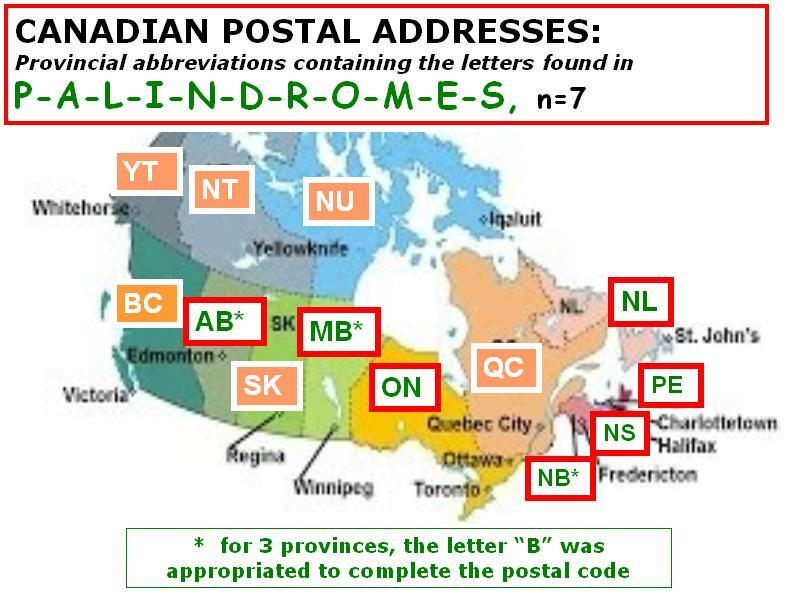 To increase the representation of Canadian provinces, a "B" was borrowed to be added for placenames in the provinces of AB (Alberta), NB (New Brunswick) and MB (Manitoba); this lets us include well-known locales like Snail Doper MB in the song. 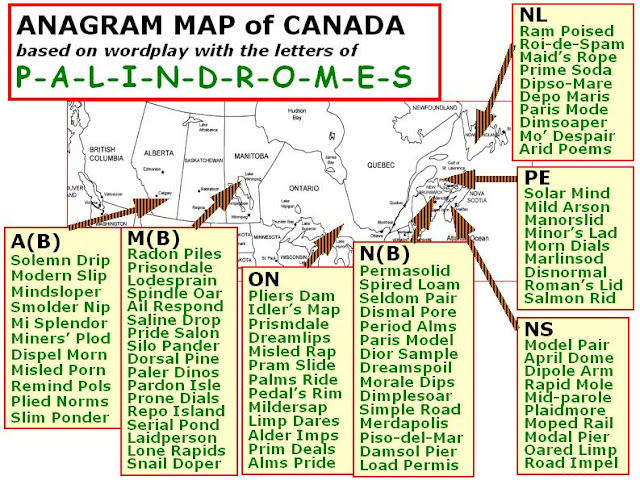 Unfortunately, the provinces of Quebec, Saskatchewan and British Columbia opted out of the arrangement. 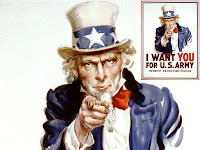 Please see the previous post on this blog for the related but very different American lyrics. Incidentally, PALINDROMES and ANAGRAMS are somewhat related types of wordplay dealing with the rescrambling of letters in words or phrases. 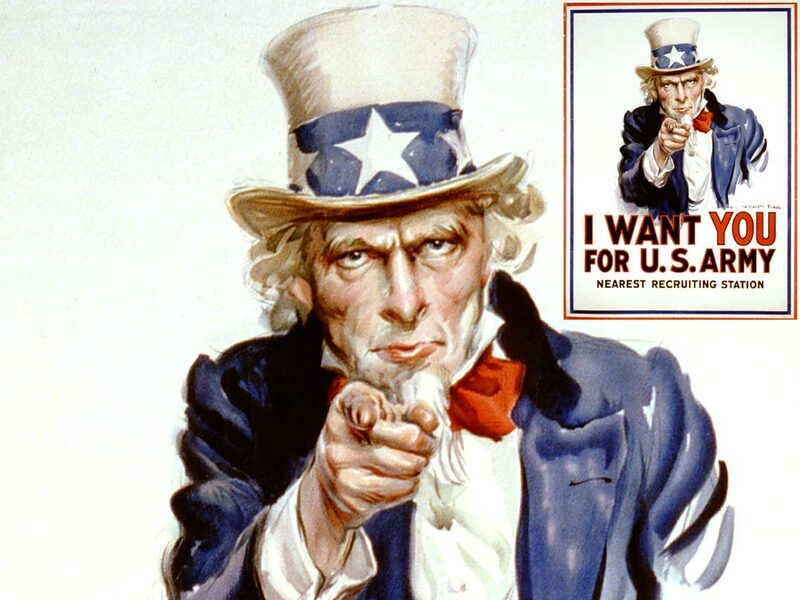 If you need to review the topic, check out the links provided. 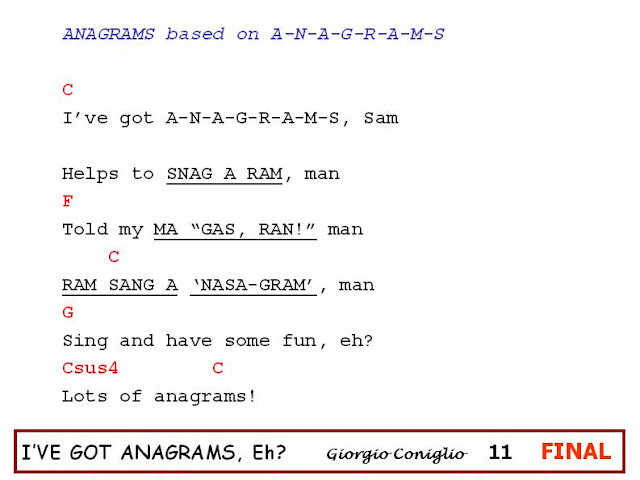 Incontinent Wordplay: I'VE GOT ANAGRAMS, Eh? Cause you start off every morning, Jumble puzzle in your hand. But first I’d need return a message, I was told that A ‘SAM’ RANG. 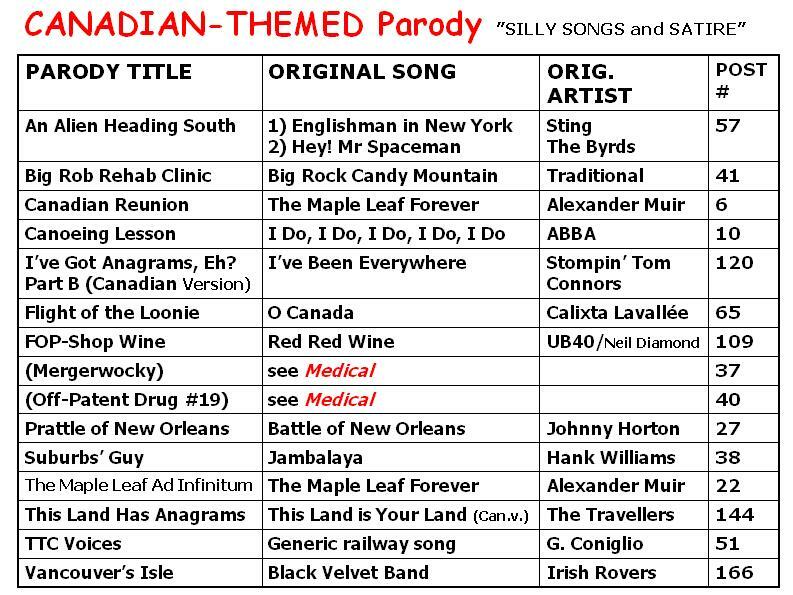 Sing and have some fun, eh? Those were places not so famous found in NS - yes! Next comes cutesy villages in PE; can you guess? Maid's Rope, Depo Maris - happily there's Mo' Despair. And Mindsloper, Mi Splendor, Smolder Nip - that's what you'll see. You'll find traces of these places when you go to Manitoba.